The daily realities of inaccessible and/or unavailable basic health services are an everyday shackle bound to communities in the developing countries throughout East Africa. 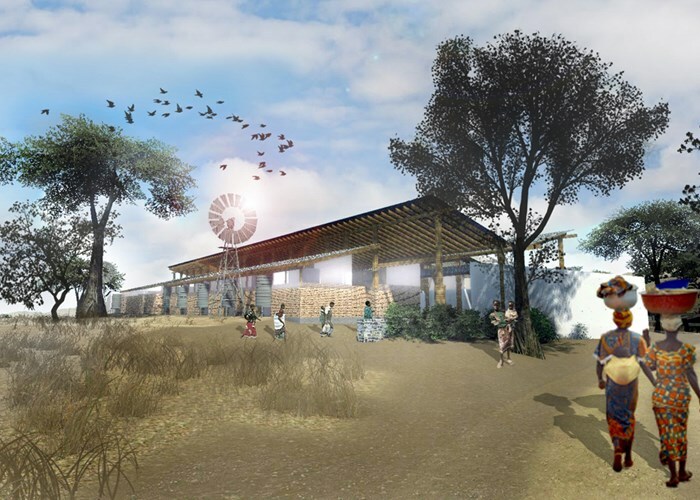 A comprehensive and tangible design for a natal clinc in rural East Africa required a responsive solution providing opportunities for health care and education where notions of refuge and access co-exist. This proposal endeavors to contribute through solutions based design a place of dignity and humanity with and for the community. The original design motivation was strongly informed by the lack of the land’s most precious resource – clean water. The concept of an expansive canopy was largely driven by the necessity to harvest water as an essential commodity for the operation of a clinic that provides health care to a multitude of disadvantaged communities. The simple design solution evolved from a pragmatic layering of parts – a central communal space encased by a grid of circulatory paths from which private sections and subsidiary gatherings spaces are accessed, with a canopy centred along the building’s longitudinal axis. This proposed spacial discipline, although rigid in plan, allows for automatic orientation from within and externally. The proptotype can, therefore, be adapted into a more modest building or into one that sprawls with the nature of its demand. The feature roof canopy oversails much of the building structure providing an extensive catchment area for rainwater. The specific functional requirements of the brief divide the building into public and private components. Privacy is achieved in the treatment and consulting spaces which are located on the perimeter and edges in combination with the screening elements and subtle changes in level. An open dialogue is set up with the public and communal functions which are located on a lower level and are grouped around open areas for waiting, teaching, cooking and interaction with others. The entrance is part of the communal area and is distinguished with the external colonnade and distinctive raintank form at the inverted apex of the butterfly roof. Within the harsh environment – both climatically and socially – the materials proposed want to celebrate the diverse and tactile quality of African culture and craftmanship. A palette of local, handmade manufactured and recycled materials articulate the structure and surfaces. The structural system was conceived as building blocks which slot into and under the oversized proportion of the canopy and its framing. Materials are simple and consist of concrete floor slabs and columns with timber posts and beams to support the exposed rafters and the roof framing. Walls are constructed of conventional facebricks, cement rendered brickwork and stone masonry extending to a height of 2.1m above the floor. Walls above the brickwork will be timber or steel framed and clad with polycarbonate sheeting to introduce natural light into the treatment and wards areas. Steel and timber can be interchanged depending on availability and cost. Details on the heavy concrete bases of columns which support the timber posts are intended to be decorated with local traditional methods and designs by the local artisans to enourage a sense of ownership.